Last weekend I participated in the Avon Mock Walk, which is a kick off day to support the men and women who plan to walk during the Avon Walk for Breast Cancer this fall. My client, Clarita, led the warm up for the mock walk, which is why I attended. With a stash of tissue in my bra and a very fresh head cold, I showed up at 8 am willing to walk, what I thought would be 4 miles. I met some amazing people, all with very touching stories and tons of enthusiasm! I had a ball. When we came to a corner, a man gave me a choice to do 4 miles to the left or 8 miles to the right. I can’t believe I made the latter choice. I was sure I’d over done it and would relapse for sure. By the last mile, we were back on the beach and I could see the Bellmont Pool in Long Beach where we started/finished. I got a renewed surge of energy and walked my heart out. It took me about 2 1/2 hours to complete the walk. It was a great day and I believe it helped me get better in the long run. My head cold was definitely cut short. I know this because my husband has had it for double the time I did. Sorry, honey. 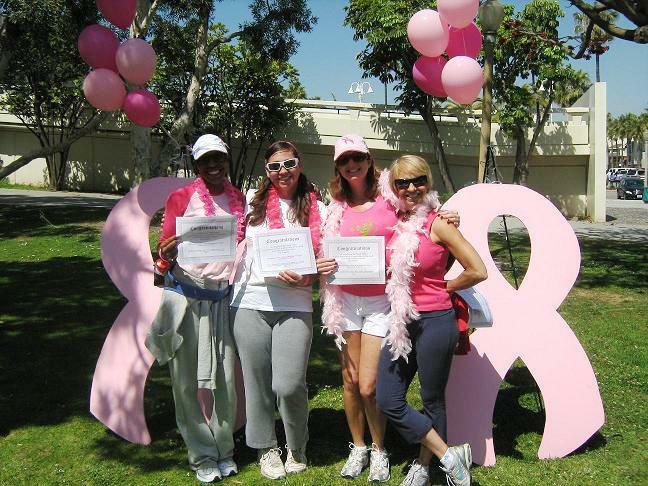 This entry was posted in fitness, Humor, Life and tagged avon walk for breast cancer, clarita, exercise, head cold, long beach bellmont pool, mambo mania, walking. Bookmark the permalink.